Here are some pics of my the front half of my mom’s sleeveless shell. 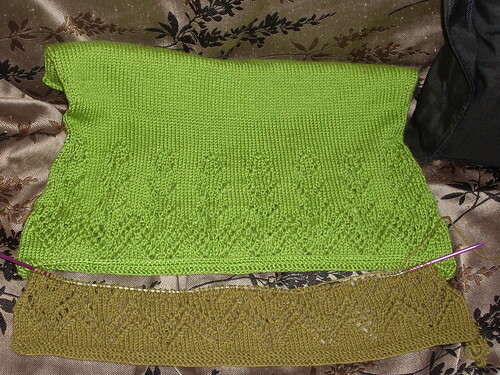 I have finished all the lace, and am now working the boring stockinette stitch. 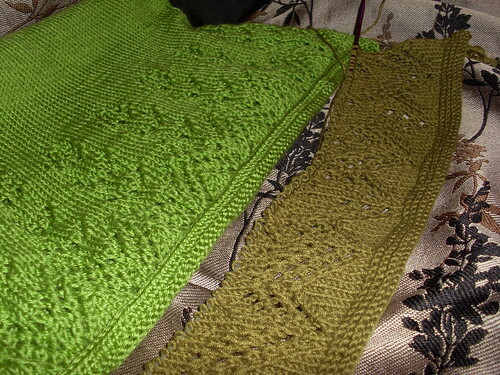 I am eager to finish boring St st so that I can start the lace for the back of the shell. 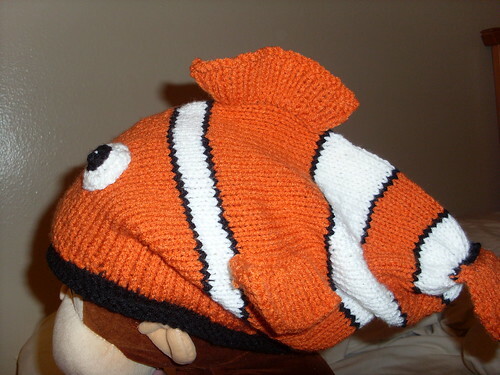 I finally took a picture of the Finding Nemo fish hat! It has been finished for a while, I just need to wash it now (notice how it doesn’t hang down in the back). 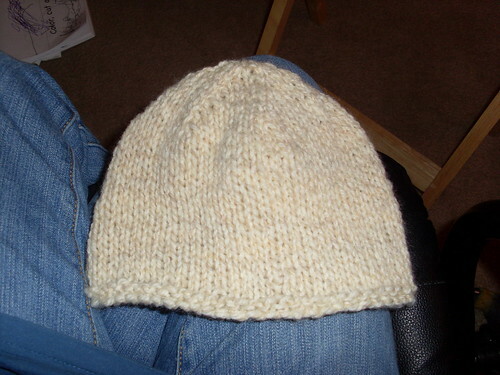 Once I get the hat washed the yarn will soften up and it will look a lot better. I am really excited about my pompom peds. 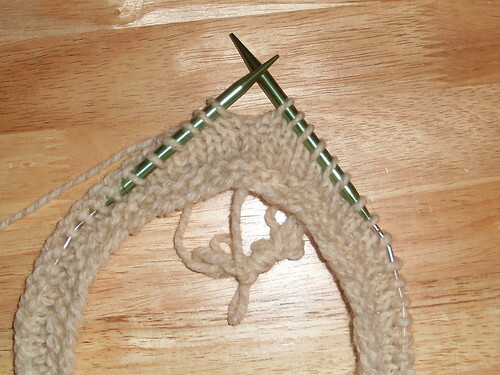 I was afraid to run out of yarn, so I stopped knitting the first sock and put it on a circular needle for now. 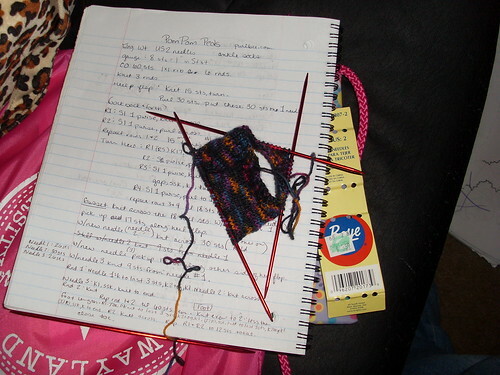 Meanwhile, I have started knitting the second sock on the dpns. I wish I had two sets of size 2 dpns so that I could knit the socks at the same time, but I don’t really NEED the extra sets of dpns. 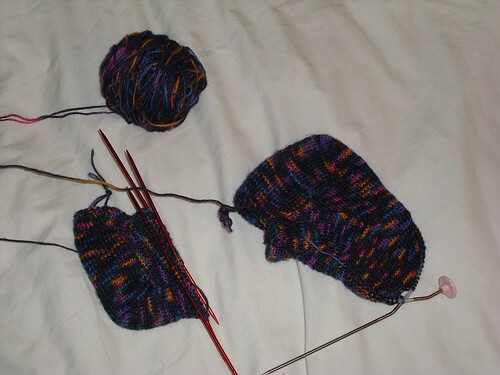 Hmm… once I start knitting more socks I will have to ask for double sets for Christmas or something. Anyhow, Here is where I am on the socks so far. The Transformers Afghan is taking a while, but now I am taking my time on it. When I started making it I was stressed out about finishing it quickly, but I realized that as soon as I finish it I will want to make another large project, and I can’t d that for two reasons. One, I don’t have a pattern for anything large that I want to make. Two, I can’t afford to buy yarn for any large projects. The first picture is of an Autobot square, and the second picture is of five Decepticon squares on one circular needle. 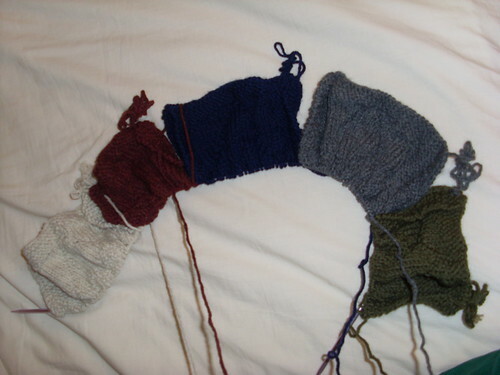 I don’t know why I didn’t think about knitting more than one square at a time. I thought that I would get my yarn tangled, but I placed each ball of yarn in a separate bag. Problem solved, no tangles! I have new pictures of several projects, today. 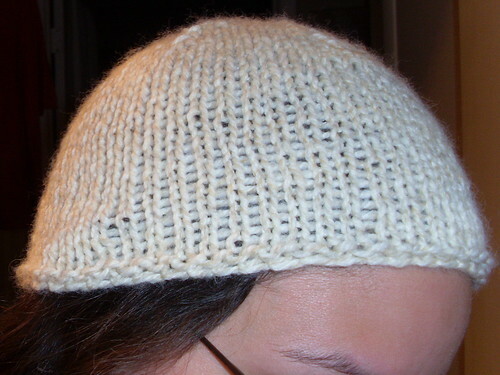 First, my Wool Noggins hat, which is hat 4 in my Hat a Week Project. 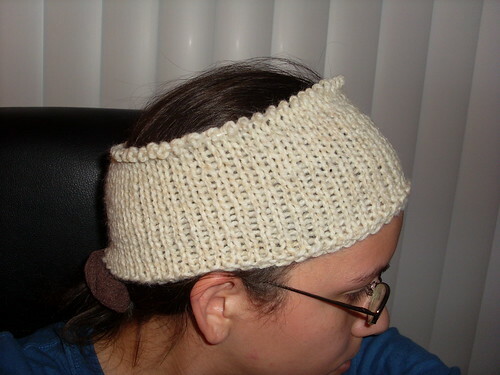 This hat was so easy and fast to knit! It only took about two hours, and I was able to finish it completely during Peanut’s nap Sunday afternoon. I have also gotten a lot done on my mom’s sleeveless shell. 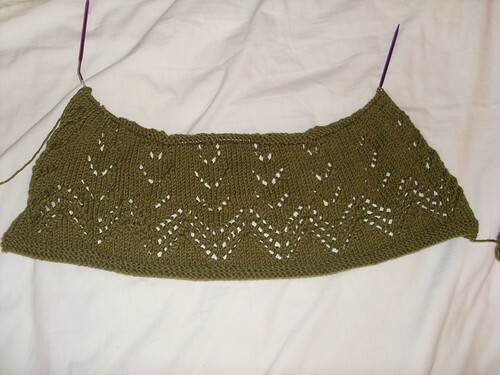 Right now I have finished the entire lace pattern of the front piece of the shirt, but I don’t have pictures of that. I do have pictures of half the lace next to the original shirt I made, and also a picture of what the pattern in the magazine looks like. I have also started working on a new pair of ankle socks using some scrap yarn I had in my stash. This sock pattern almost got thrown out after I made the first half of the first sock and I realized the sock was huge! 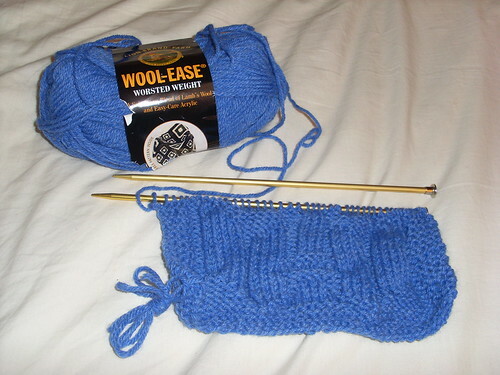 I followed the pattern and used the right size needle and yarn, but I didn’t check my gauge. Apparently I was knitting too loosely and the sock was over-sized. I unraveled it Sunday night and started it over. By Monday night I had a nice fitting sock, and it looks like I may have enough yarn to complete both socks. I was getting worried that I might have to have different colored toes on them. This is a picture of the over-sized sock that I ripped out. I will take pictures of the new version of the socks soon. So I was knitting some house socks out of Bernat Satin Sport yarn, and I am sad to say that the socks were a disappointment. 😦 I completed the first sock, put it on, and was horrified. The pattern was okay, but I would have changed the placement of the heel flap. The directions didn’t clarify that I should center the lace, and as it was y first lacy sock I didn’t know I was supposed to. As soon as I began knitting the length of the foot, I noticed that the lace was lopsided! 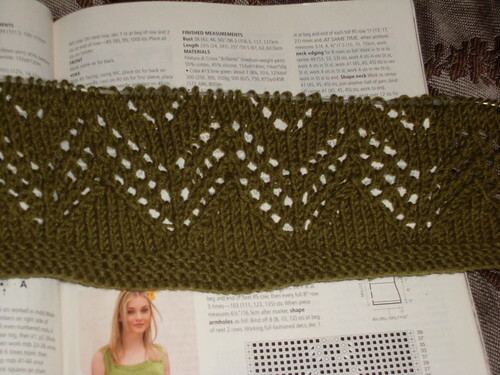 The eyelet/yarn over section should have begun a few stitches later, not where I put them. 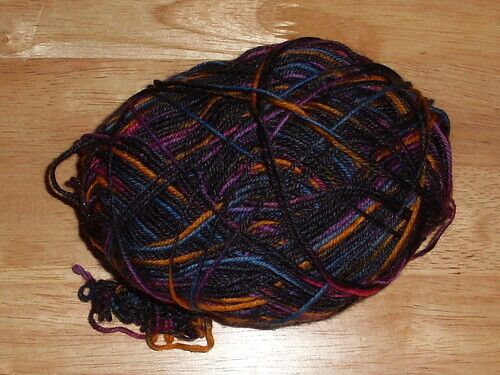 Also, the yarn is a nice choice for scarves and hats, maybe even a sweater, but it is terrible for socks! I could literally feel the acrylic rubbing against itself when I put the sock on! Needless to say I was very disappointed with my sock. I will once again rip out a project made from this yarn. So far I have ripped out two blouses and one sock made from this yarn. 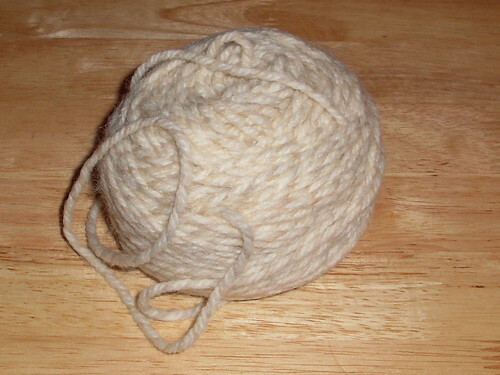 I think I will try either a hat or a scarf pattern with this yarn (I have about 2 1/2 balls at about 220 yards per ball). I wish I had it in both white and black so that I could make my nephew the pirate hat I have been meaning to make. 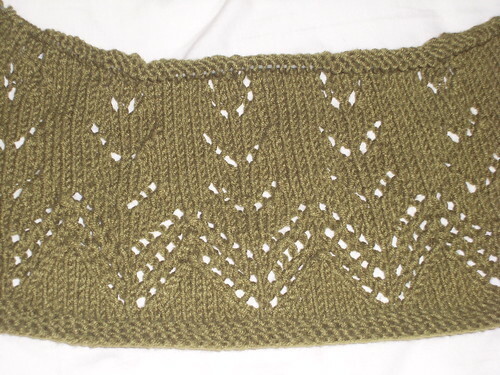 The pattern calls for sport weight or dk yarn, and I only have worsted weight yarn in black and white. On a completely different note, I decided to cut Peanut’s hair today while he was in the tub playing. Hubby ran in with scissors, snip, snip, and it was over. Peanut didn’t even notice. However, I want to cut it more since it is starting to look more and more like a bob hair cut to me. Maybe we should just shave it all off. We have slippers, but I am just afraid to accidentally cut him in any way. We have discussed cutting his hair while he sleeps, but I am apprehensive since that would mean that his hair might be very uneven and there would be hair all over the sheets.